The many colored threads of John Eichinger's String Mandalas form an intricate universe, where outer circles swirl and become inner, rainbow hues blend and pulse, and straight lines disappear in an illusion of curves. To string artist Eichinger, this optical trickery is a delightful reminder that things are not always what they seem. And the result is a visual sixxle that leads the artist - mindful of Webster's definition of a mandala as "a graphic symbol of the universe" - to refer to his creations as "energy maps." By whatever name, the mandala motif is a plus factor when he's exhibiting his works, according to the artist. The designs themselves attract attention, he explains. "Each one is a microcosmic map of principles that happen within the universe. Some resemble, for example, orbital maps of the planets. The six-foot six-inch artist explains that his interest in geometric designs dates back to his boyhood in New Jersey when he was fond of doodling. But his first attempt to carry on this interest did not occur until long after, when he was on his own, living in his first apartment. Wanting to draw a mandala on the wall, instead he nailed a design and wove the pattern in string. Although this artistic experiment intrigued him, it went no further; his career interests lay elsewhere at that time. After studying engineering for two years at the U.S. Naval Academy in Annapolis, he worked as a systems analyst with the phone company and later an international banking firm. Dissatisfaction with the corporate business world and a search for other values prompted him to spend several years hitchhiking across the U.S., Europe and Central America. To pay expenses he resurrected his string art idea and began making mandalas, selling them on street corners, craft shows and art galleries. His method has remained largely the same since he began in 1972. First, the pattern is sketced on paper over wood covered with ultra-suede. Then, small escutcheon pins are hammered in, outlining the pattern. After tearing the paper pattern away, he winds the thread back and forth from pin to pin. The first time through the pattern, he counts pins and spaces, but after that his well-trained eye and sense of rhythm carry on by "feel." For Mr. Eichinger, the joy of his particular craft derives not merely from working with his hands, but from the nature of involvement it requires: a high level of concentration, the direct application of universal geometric principles to a concrete act, and the pursuit of quality. "The whole basis behind my work is precision," he says, "requiring close attention to details - the angle, spacing, and height of pins; the tension of the thread; and continuity of pattern. Otherwise, the illusion, the effect of the whole will be flawed. "A single design can take from two hours to several days to complete, depending on its size and intricacy," he continues. As many as 45 layers of thread and up to 25 colors may be woven into one work. He uses cotton-covered polyester thread rather than mercerized cotton, "because its stronger and will last a lifetime." With knots tied discretely behind pin heads, a finished mandala intrigues with its filmy and flawless effect. As Mr. Eichinger moves toward ever-larger and more complicated designs, the computer is an increasingly essential tool for obtaining the pinpoint stringing sequences. Larger works offer the scope for more complexity and for greater variations in color blending. "The real creative process lies in larger works," says Eichinger, whose most spacious project yet required almost two months to complete. 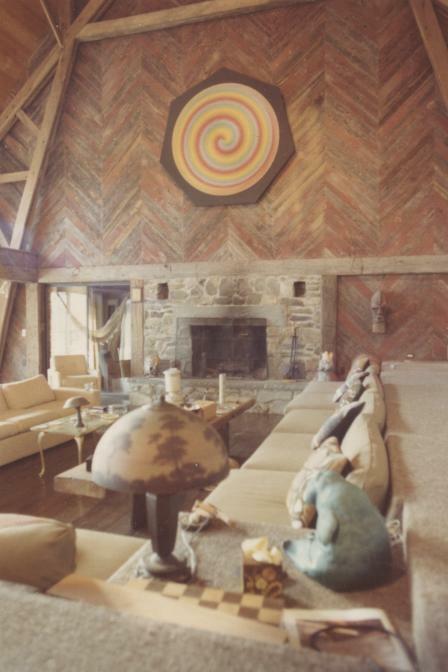 It was a custom-made seven-foot diameter design for a two-story wall in the renovated-barn home of Mr. and Mrs. John Ginsberg in Warwich, NY. "The rainbow-colored round Spectral Spiral Mandala (scroll down) is composed of 27,000 lines, averaging six feet. Stringing it was like doing a dance," says the artist. "I had to use my whole body, swaying back and forth. I could just comfortably reach the long ones, but anything bigger than the seven-foot diameter would have been more difficult." One of the artist's long-range goals is to work with designers and architects to incorporate mandalas into the interior decor of buildings - and perhaps into structural features themselves. This free-wheeling young craftsman feels that even quite conventional settings could benefit from the mandala motif. A library could use huge metal mandalas as room dividers, for instance, or a bank might have the parabolic principles of one supporting a staircase. This is still in the future though. Mr. Eichinger, meanwhile is working hard on his string designs, taking the advice he offers any beginning craftsperson: "If you can maintain a high level of quality then your art will sell itself."